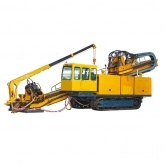 The DFHD-28(Z) directional drilling rig is driven with full hydraulic system, propelled with its own crawlers. gravity, the rig is durable and reliable and in good stability with graceful structure. * With high torque and stable performance, the drill head is driven by four parallel motors in two speeds. pulling backward and in high and low, the two speeds. be adjusted flexibly according to different geological conditions and performance techniques. accessories and could be produced in accordance with the requirement of clients unusually. the efficiency will be increased and the intensity of labor will be decreased.